At the base of Rwanda’s Volcanoes National Park, infant mountain gorillas were celebrated during the Kwita Izina naming ceremony. Kwita Izina is inspired by the ancient Rwandan tradition of naming a baby soon after its birth.During this ceremony, infant mountain gorillas that were born in Rwanda during the previous year receive their names. At this year’s ceremony 19 infant mountain gorillas will be named, as well as one newly formed family. About 239 mountain gorillas have been named over the course of the Kwita Izina ceremonies. 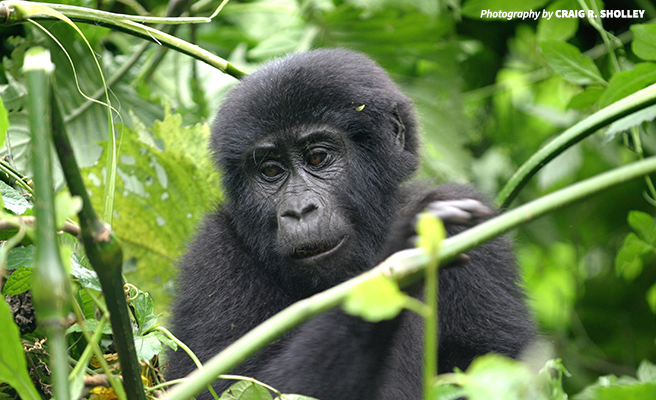 There are less than 1,000 mountain gorillas remaining in the world. This critically endangered species is found only in three countries, spanning four national parks. Mountain gorillas generate significant tourism revenue, providing direct economic benefits to communities. In 2016, Rwanda generated about US $400 million in tourism revenue — the majority of which was from tourists visiting the country's mountain gorillas. In 2008 former AWF CEO Patrick Bergin had the high honor of naming a gorilla. He called her Sacola. Gayane is AWF's Digital and Partner Marketing Manager. She oversees online fundraising, social media marketing and affiliate relationships. Gayane is passionate about communicating the message of conservation through new tools and technologies and finding ways to make information easily accessible. She is a graduate of the University of Florida.